Prof Dr Susai Rajendran has been serving the Student Community for the past 43 years as Professor of Chemistry. 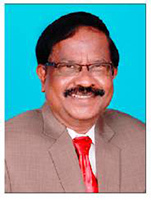 He is still continuing his research activities in the field of Corrosion and its control, Green Inhibitors, Concrete Corrosion, Corrosion resistance of metals and alloys in various body fluids, Synthesis and Characterization nano particles, Electro organic synthesis … He has received National Meritorious Award in the field of Corrosion, twice, from NACE, India Section. He has authored 9 Books and 3 Patents. He has published more than 300 papers in reputed Journals and produced 40 + PhD Degree Holders. Presently he is Serving as Professor of Chemistry and Research Director at St Antony’s College of Arts and Sciences for Women, Dindigul. He is standing on the shoulders of his Students. He is taking Research towards the Down Trodden.